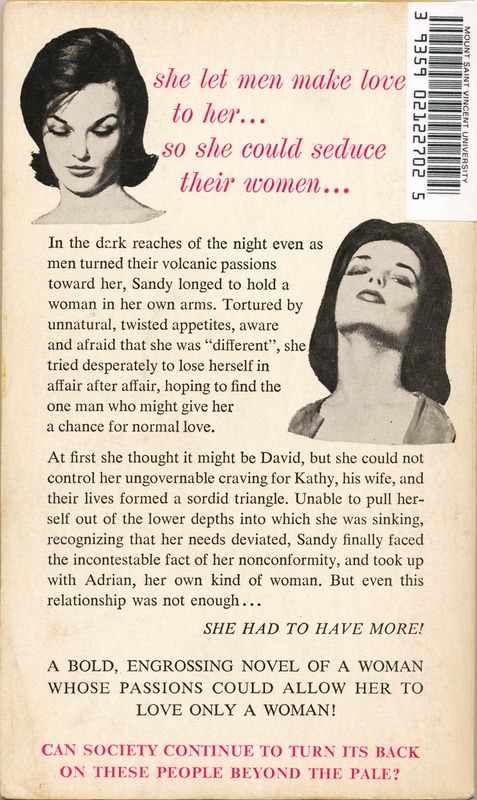 Sandra Tried To Love Men… But Couldn’t Resist Their Women! Lesbian Love: Can it ever be condoned? Here is a powerful novel which intimately relates the other side of the story! In the dark reaches of the night, even as men turned their volcanic passions toward her, Sandy longed to hold a woman in her own arms. Tortured by unnatural, twisted appetites, aware and afraid that she was “different”, she tried desperately to lose herself in affair after affair, hoping to find the one man who might give her a chance for normal love. At first she thought it might be David, but she could not control her ungovernable craving for Kathy, his wife, and their lives formed a sordid triangle. Unable to pull herself out of the lower depths into which she was sinking, recognizing that her needs deviated, Sandy finally faced the incontestable fast of her nonconformity, and took up with Adrian, her own kind of woman. But even this relationship was not enough… SHE HAD TO HAVE MORE! A Bold, Engrossing Novel Of A Woman Whose Passions Could Allow Her To Love Only A Woman! Can Society Continue To Turn Its Back On These People Beyond The Pale? Previous Previous post: Tell It To The Feds!